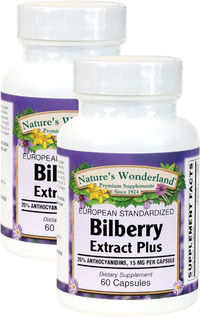 Bilberry Standardized Extract Plus - 60 mg, 60 Capsules each (Nature's Wonderland) - Penn Herb Co. Ltd.
Bilberry Extract nourishes and supports healthy vision. Its active compounds known as anthocyanidins, strengthen and provide antioxidant protection for delicate eye tissue. 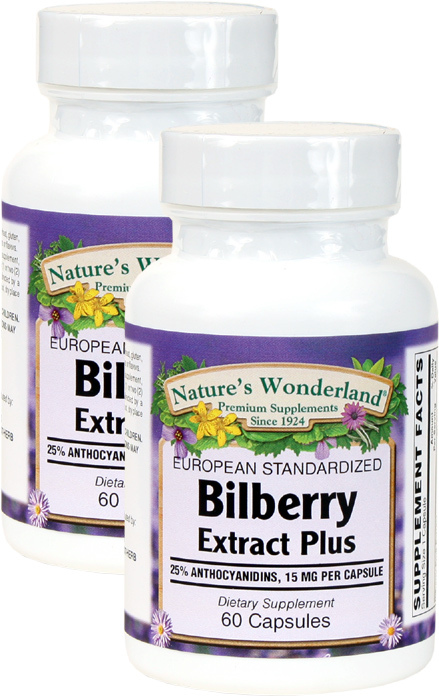 Our Bilberry extract provides an optimal level of 25% natural occurring anthocyanidins. Additionally, it contains a full spectrum of components as they occur naturally in fresh whole Bilberries. Supports healthy eyes and eyesight; free radical support for healthy eyes. As a dietary supplement, adults take 1 capsule, 1-2 times daily with meals, or as directed by a health professional.